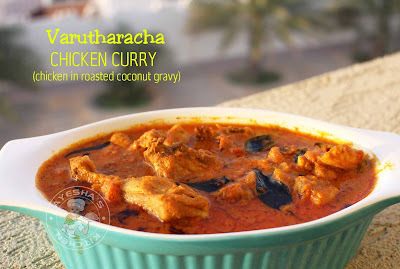 Varutharacha chicken curry or chicken in roasted coconut gravy is my family favorite chicken curry which is usually paired with Malabar nice pathiri (ari pathiri). This chicken dish is going to be a great treat for your taste buds, I bet. Malabar recipes are very popular around the globe. This chicken curry recipe is one among the popular Malabar recipes. During Ramadan, varutharacha kozhi curry and pathiri will be the center of attraction in most of the households in Kerala. As Ramadan is almost close, I recommend my viewers to try this recipe for iftar meal and enjoy with your loved ones. Marinate the cleaned chicken pieces with all those ingredients giver under for chicken marination and add it into a deep bottomed pan. Cook it over a low flame without adding water. The chicken itself will release water once t is hot. Cook until the chicken gravy turns thick. Meanwhile, we can roast the coconut. Heat a pan for roasting the coconut. Add coconut oil, once the pan is hot. To this, add the scraped coconut and roast it over a low flame. Then add chopped shallots, garlic, fennel seeds and curry leaves. Saute it over a low flame until the color of the coconut changes to yellow. Now add the spice powders one by one. Chili powder and coriander powder. While roasting chili powder, adding a pinch of salt helps to get rid of the roasting smell of chilies. Saute continuously until the coconut mixture turns crisp. When done, let it cool slightly and then powder it for easy grinding. Add the powdered coconut mixture to the blender along with water(do not add more water) and grind it very well until a smooth and fine paste (very important). 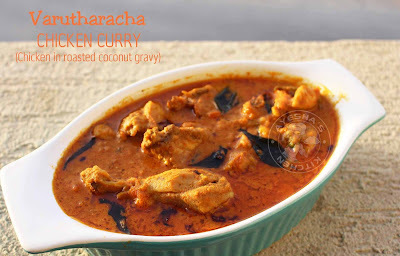 When the chicken gravy is cooked well over a low flame, add this roasted coconut mixture to it and cook well again over a low flame. Check for salt and add required water (do not add more) let it cook well until the oil floats on the top. When done, season it with all the ingredients given under for seasoning. Remove from flame and set aside the curry covered for few minutes and serve hot. Yummy varutharacha kozhi curry is ready. You can serve this along with Malabar nice pathiri or ghee rice or paratha, chapati etc.